The real joy of travel is in the air. Take off with one of the youngest fleets in the region, equipped with luxurious and spacious cabins with enough elbow room. The latest inflight entertainment, Wi-fi, and of course, fine dining makes our offering a cut above, whether you are flying BusinessFirst or Economy. Choose BusinessFirst for the perfect balance of comfort and luxury. Our sleek and gentle superb leather premium cabins are designed to satisfy your desire for exceptional comfort. At SaudiGulf, we tend to take good care of the smallest details in order to make you enjoy every last part of your experience until you reach your destination safely and energetic. Economy doesn’t mean compromising on space and comfort. 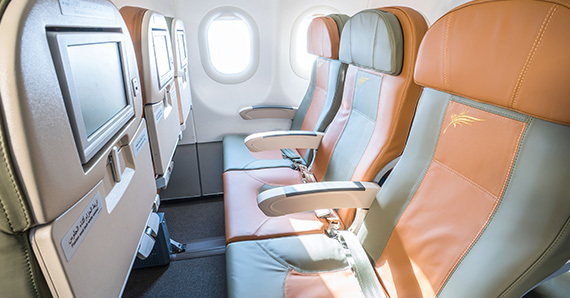 Our economy cabin seats are fitted with exclusive leather seats along with shoulder support. 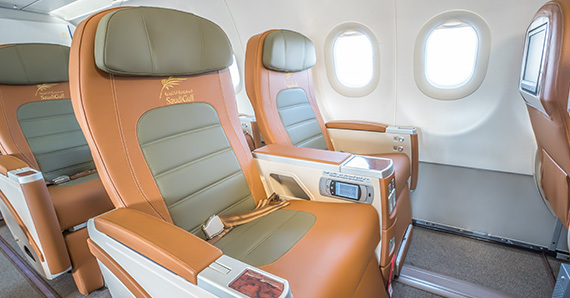 This friendly and efficient cabin offers plenty of leg room, In-flight entertainment system and the ability to say hello from the skies with our internet connectivity available on all flights. 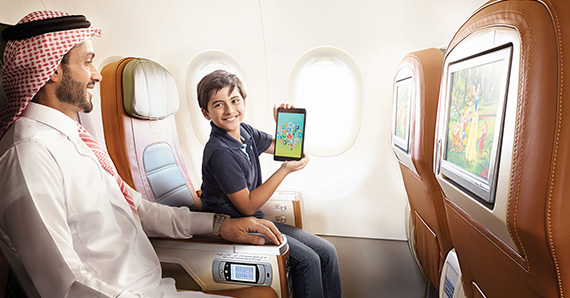 Experience inflight entertainment at the next level. 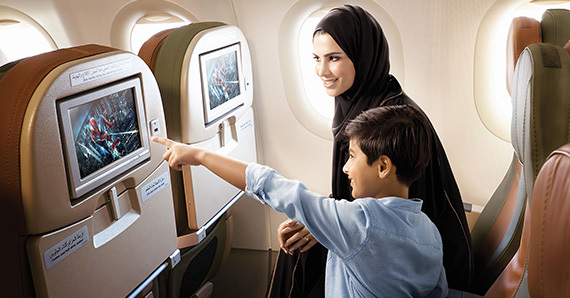 For the first time in the Kingdom, you can watch the latest movies, TV shows, music channels and games on domestic flights in both our BusinessFirst and Economy cabins. For your convenience and listening pleasure, all our programmes are available in both English and Arabic. With the state-of-art connectivity system, the world remains at your fingertips without any interruption so you can sign in to our Wi-fi, browse the web or call and catch up with family and friends. We have extended our authentic Arabian hospitality to serve you specially prepared hot meals which certainly will leave a mark on your taste buds. We consider dining in the air is as essential as the journey itself, and make sure that all of your senses will remember our exquisite food in both Economy and BusinessFirst cabins, long after your flight.